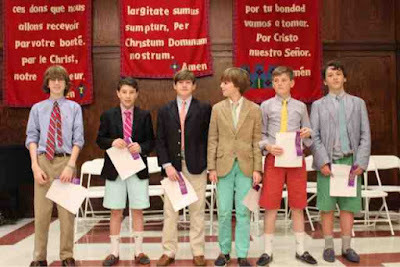 Saint David's boys consistently do well on the National Latin Exams, and the school is always extremely proud of their accomplishments. It is a tough exam. But this year they outdid themselves, with a record breaking 6 boys earning perfect scores and 10 additional students scoring 98%. This is truly a remarkable achievement when you consider that the exam, despite its name, is international in nature. 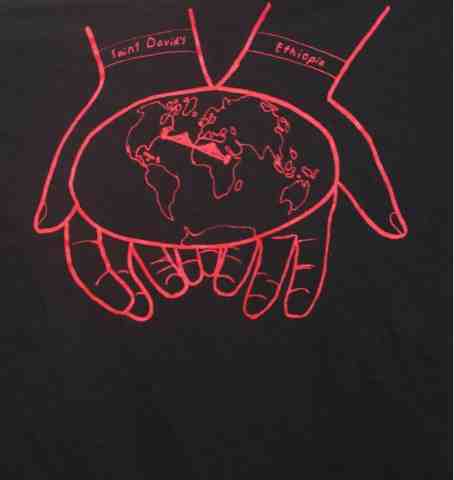 Of the 19,000 participants worldwide, including students from Australia, Canada, England, Singapore, and South Africa, only 600 received perfect scores, and 6 of those were Saint David's boys. 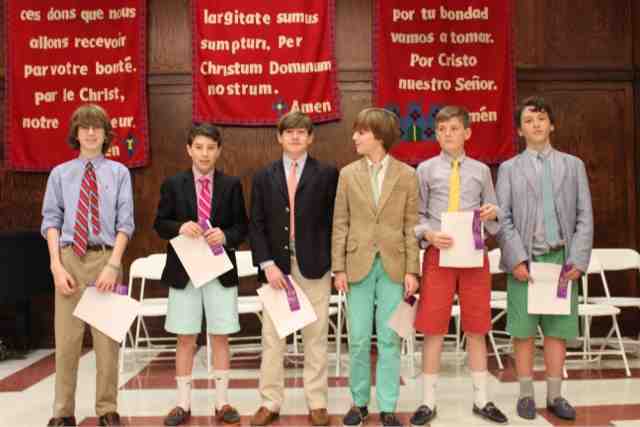 Congratulations to seventh graders Timothy C., Andrew C., Michael H., Alexander K., Valdimir M., and Tomas R., and to their teachers Dr. King and Mr. Romanosky. On what was perhaps the first beautiful day of this spring, I had the opportunity to visit alums in Massachusetts and northern Connecticut. We currently have quite a contingent at Deerfield (7) and two at Suffield Academy. 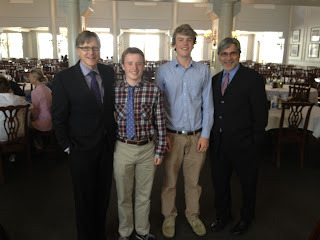 Graduating from Deerfield this month, Daniel is off to Washington University in St. Louis, Eric Georgetown, Travers the University of Virginia, and TJ will be attending Southern Methodist. At left, the boys and I gather together after lunch in the main dining hall at Deerfield (Daniel, Erik, Travers, Franny, Cordy, and Felix), and at bottom, I'm under the bell at Suffield with Daniel '11. We covered a lot of ground over lunch and walks around the boys' respective campuses. Ideas from alums about ways to further strengthen an already strong Saint David's program are the highlight of my excursions. 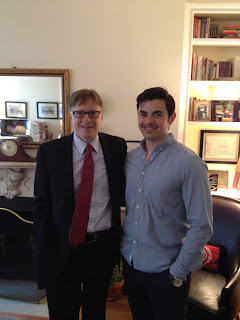 A member of my second graduating class Adam '06, visited today. Having just graduated from Penn State, Adam is now employed. He has a job working with a large personal fitness, exercise outfit downtown which includes the development of a virtual fitness dimension. It was fun catching up with Adam. He spent time visiting old friends at Saint David's. In another example of a new field trip incorporated into our academic program to enrich learning, our second graders visited the Skyscraper Museum yesterday. In class throughout the year, the boys have been studying New York City's history, from the early days of its Lenape tribe inhabitants up through the city's role during the American Revolution. Much of their study has been done in partnership with the New-York Historical Society. Curators and education specialists visit the boys at Saint David's, and the boys visit the NYHS several times over the course of the year. The boys have looked at the ways in which the city and its inhabitants have evolved. Yesterday's visit to the Skyscraper Museum was a culminating experience that explored a unique city's ever-changing skyline. Boys reflected on how different our city of tall buildings today is from the time of the Lenapes followed by the early European settlers. They have been exploring the concept of New York as an urban community. 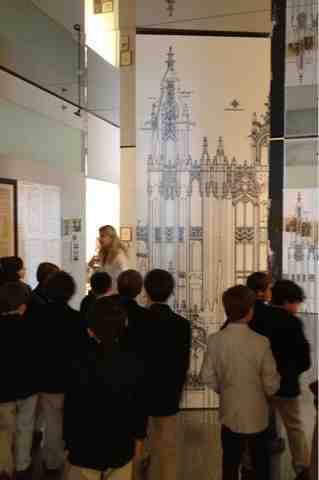 At the museum, the boys examined the unique characteristics of skyscrapers, such as the Woolworth Building and the new Freedom Tower. Each boy will end the year creating his own New York City skyscraper with his art teachers with a special eye to architecture. The boys will then join together and present the "community" they've created. This yearlong multidisciplined study of New York has been a prime example of the type of active learning that incorporates many hands-on and diverse activities --theory and practice--which increase understanding and spark creativity--a signature unit in the second grade. 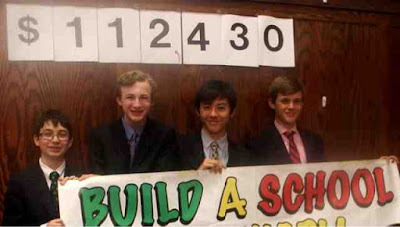 Yesterday during each lunch period, our Student Council informed all the boys of exciting news: The school has reached (exceeded) our Dollars for Ethiopia Scholars fundraising goal and has raised more than $112,000 to date. But our boys aren't finished! 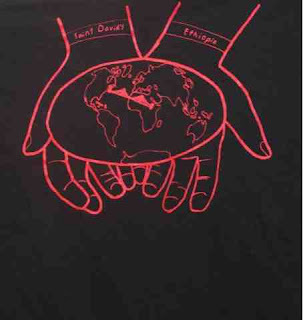 They will continue to hold fundraising activities for the remainder of the school year, including a t-shirt sale with a design created by one of our boys (see photo), in support of the project. We reported last month as construction began on the school in Tigray, Ethiopia, due to open in September. By surpassing our goal and continuing our fundraising, we will be able to not only completely build the school and provide it with much needed resources, but also construct an early childhood center. Our First Grade boys spent a beautiful spring morning at the Top of the Rock observation tower in midtown Manhattan to conduct a field study of select NYC landmarks, while incorporating aspects of map skills they had learned as well. The activity is the newest component of the First Grade social studies program, which focuses on the landmarks and geography of New York City. Saint David's has been increasing the frequency of experiential learning opportunities to reinforce and deepen understanding of key concepts learned in the classroom by providing more field trips in all grades. All of our out-of-classroom experiences are strategically developed, directly connected to the curriculum, and focused. The world is our classroom, and what better place to see much of it than from the Top of the Rock! The photo above depicts the boys looking south. 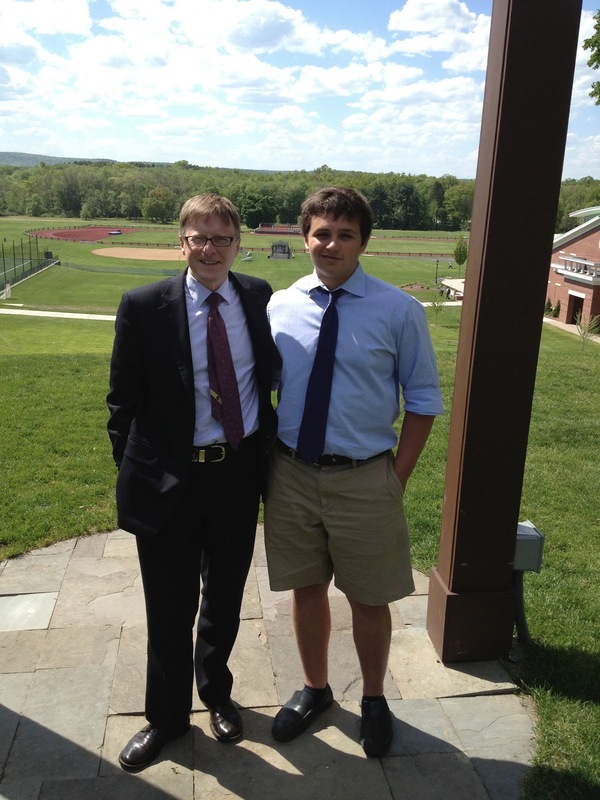 On a beautiful first Day of May, Imbelli and I trekked south to visit alums at Episcopal and St. Andrew's. At Episcopal, greeted with the gentility and hospitality that so typically epitomizes all things southern, we enjoyed meeting with the headmaster and admissions director. Lunch in the dining hall with Doug '09 and James '08 was thoroughly enjoyable. Finishing up his last year, Doug is off to U. North Carolina. James is thriving in his Junior year, playing JV soccer and has, surprisingly, discovered a passion for wrestling. He is looking forward to welcoming another alum to EHS in the fall--the Saint David's southern connection remains unbroken. Unfortunately, our Saint David's alum at St. Andrew's is traveling today so we'll be catching up with him at a later date.